Last week, a reader asked whether I had a recipe for low-sodium Thai peanut sauce, and although I unfortunately don’t, it did remind me of today’s recipe from The Everything DASH Diet Cookbook. So here you go! 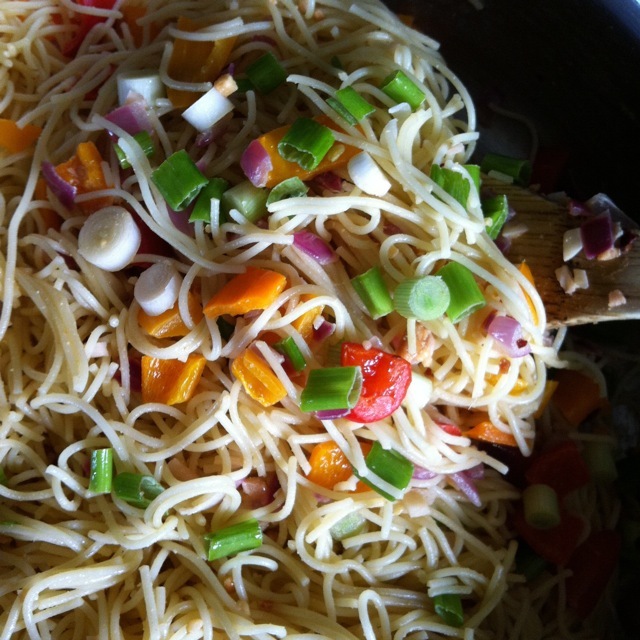 These spicy noodles will satisfy your hunger for something healthy and filling like nothing else. If you use creamy peanut butter, feel free to add a tablespoon or two of chopped peanuts to the mix. I like to sprinkle liberally with salt-free seasoning and black pepper before serving – and of course, keep extra red pepper flakes close by to up the spice. If you’d like to make a straight sauce instead (or simply expand the recipe below), try adding a dash of rice wine vinegar to the peanut butter mixture, as well as a tiny bit of red curry paste or sriracha. Just remember, cooking is all about improvisation, especially when the target audience is YOU! Cook pasta according to package directions, omitting salt. Drain. Add 1 teaspoon sesame oil to cook pasta and toss well to coat. Set aside. Heat remaining 2 teaspoons sesame oil in a saute pan over medium heat. Add onion, garlic, and ginger and saute 2 minutes. Add bell pepper and saute 3 minutes more. Remove from heat. Stir in broth, peanut butter, lime juice, red pepper flakes, and scallions. Add pasta to pan and toss well to coat. Serve immediately. This entry was posted in Main Dishes, Vegan or Vegan Adaptable. Bookmark the permalink. This was an amazingly delicious quick meal – I really loved the combination of peanut butter and spicy! Aww that’s awesome baby! SO glad you liked it – and wanted to share. XO! This sounds great! I love Asian inspired noodle salads. Hope you don’t mind my adding that I posted a delicious low sodium Thai Peanut Sauce a while ago. It was actually a low sodium version of one a pal from the Cooking Forum shared. Also, I heard about a brand of Thai curry pastes that are extremely low in sodium: Thai and True. I ordered a sample from the website, but Amazon carries their products too. I’ve been using their Red Curry Paste for about a year. Are you ready for this? Only 5 mg. sodium per tablespoon. Pretty amazing, huh? Sue, I don’t mind at all! That’s wonderful. I’ll also send a link to the woman who wrote to me last week; I’m sure she’ll be thrilled. And as for the red curry paste – holy smokes! What a find!! Will definitely check it out. THANKS SO MUCH! I agree. The red curry paste is an amazing find. Usually Asian flavorings are prohibitively high in sodium. By the way, your post inspired me today when I went shopping. I decided to make some Thai-style noodle soup. I got some bean sprouts, mushrooms, cabbage, and green onions to go along with the jalapeno, cilantro, coconut milk, peanuts, and rice noodles I’ve already got on hand. Should be good. Man, Sue – that soup sounds fantastic!! RECIPE PLEASE! I got really excited when I saw this comment about Thai and True curry paste! Unfortunately, it looks like they must have changed their recipe, because their website is showing all of the curry pastes as having over 300mg sodium per tbsp. Are there any other low-so brands you have found that you could share? Thanks! This recipe does sound delish!! Can’t wait to try! Love your cookbook, and very glad to have you back posting your wonderful recipes! Aww thanks so much, Pat! ENJOY! This looks delicious! Can you tell me if you are using dark sesame oil?